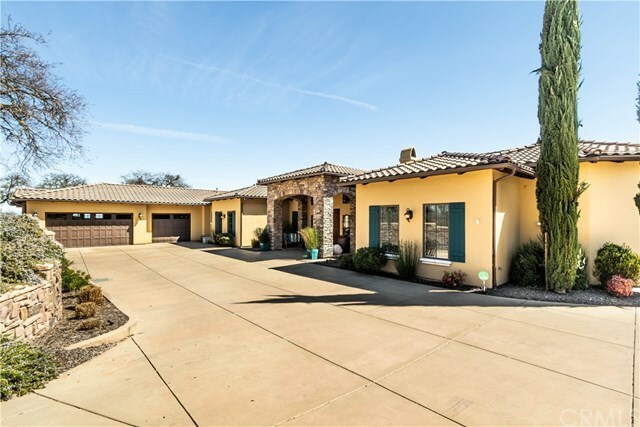 Gorgeous Upscale Single-Story Home with Amazing Views, located in the very Exclusive Santa Ysabel Ranch Gated Community! This exceptional estate home offers 3 bedrooms plus office, 4 bathrooms, a 3-car attached garage on 2.33 acres. The well-designed open floorplan provides formal living and dining areas, a separate family room, another breakfast nook dining area off of kitchen, inside laundry room, built in bar and a custom wine room. The luxurious interior features an ultimate chef's kitchen with granite countertops, all stainless-steel appliances, 6 burner & grill Viking cooktop, 2 convection ovens, a walk in pantry, multiple built in refrigerators, and a large center island with prep sink. Master Suite offers an oversized retreat with a lovely ambiance, a fireplace and views. Interior is enhanced with Anderson wood cased windows, solid core 8 ft doors, wood and stone flooring and 10 to 15 ft ceilings with elegant crown molding and rich wood beams. Expansive landscaping surrounding entire home includes a lovely outdoor living area with large covered flagstone patio to enjoy all of the breathtaking views, a side yard with 3 custom stone garden boxes, fruit & olive trees, and an area to entertain guests and BBQ. Come and enjoy the rural peacefulness of this 24-hour guard gated community which features walking/hiking trails, a private lake and lighted tennis courts all on old historic Santa Ysabel Ranch. Don't miss out on this perfectly maintained and updated beauty!